Today on the 14th of November, we get to experience yet another Supermoon. The concept originates not from astronomy, but is often used by the media, when a full moon is especially close to Earth. 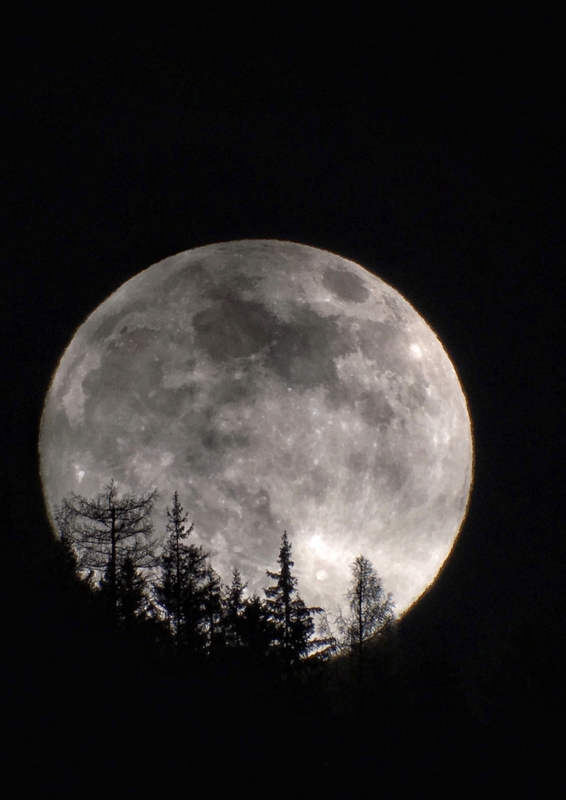 How do we get a “supermoon”? The Moon does not orbit the Earth in a perfect circle, rather in an elliptical shape. As a result, the Moon sometimes reaches a distance, where it is closest, which is called the Perigee. During the perigee, the Moon is about 360,000 km from Earth, while it is about 400,000 km from Earth at its Apogee – or furthest distance. The phases of the Moon (full, gibbous, crescent, new) depend on its position relative to Earth and the Sun. That’s how we get a New Moon or Full Moon. Should the Moon be full and simultaeously found at its perigee, the media will refer to it as a Super Moon or a Super Full Moon. The moon appears during this phase to be 14% larger and 30% brighter than at the point, when it is furthest from Earth. For anyone, who has trouble imagining this concept, can use coins to help illustrate it. The size of a nickle or one-pound piece can represent the size of the full Moon at its apogee, while a quarter dollar or two-pound piece would be the size of the Moon at the perigee. So, if you should have the luck of clear skies, have a look at the full Moon. Ask yourself if the brightness and size are noticeable. With clear skies, you could have a great opportunity to image a spectacular Moon.